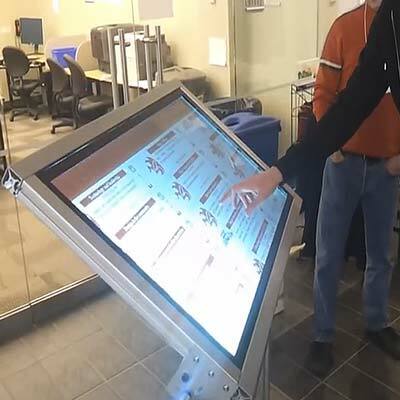 A BarCamp event, put on by grass roots and technology passionate thought leaders, is a conference style event where the event schedule is created and decided upon by the conference attendees through a multitouch voting interface. Attendees would create conference session ideas and their peers would vote to decide which sessions would be held. Zyris developed a web based voting system, supported by a touch screen interface display. Zyris developed the underlying software behind the conference session voting system for Barcamp Calgary 2012. This included a web-based front end that allowed users to create a conference session listing and promote it through the BarCamp Calgary voting website. Once conference sessions were created users could vote for their favorite sessions either through the site or using the central touch interface display kiosk, featured in the main hall of the conference. The web-based voting system that Zyris developed collected more than 300 votes from over 50 participants for more than 45 conference session ideas while finalizing and scheduling 20 conference sessions over a period of two days.